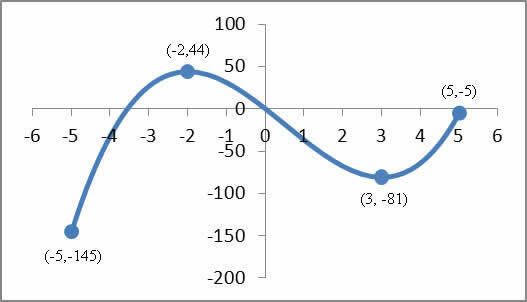 Points of Inflection are locations on a graph where the concavity changes. 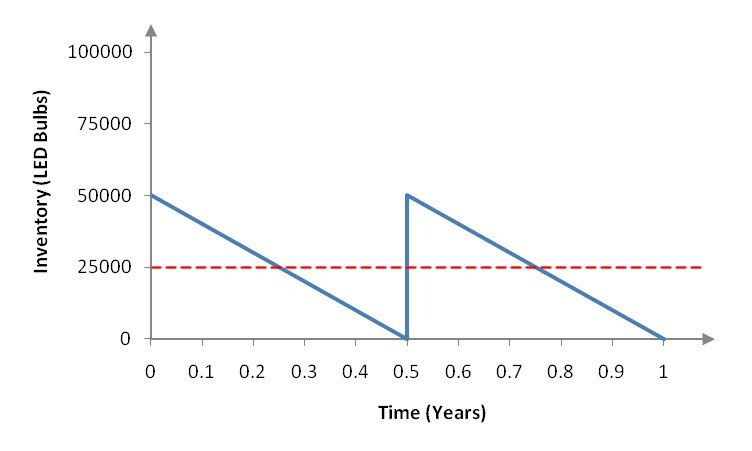 In the case of the graph above, we can see that the graph is concave down to the left of the inflection point and concave down to the right of the infection point. We can use the second derivative to find such points as in the MathFAQ below. What is the significance of this point? On both sides of the inflection point, the graph is increasing. This means that as the number of connections increased, so did the revenue from those connections. However, on the left side of the inflection point, the increases in revenue due to increasing connections is getting smaller and smaller. 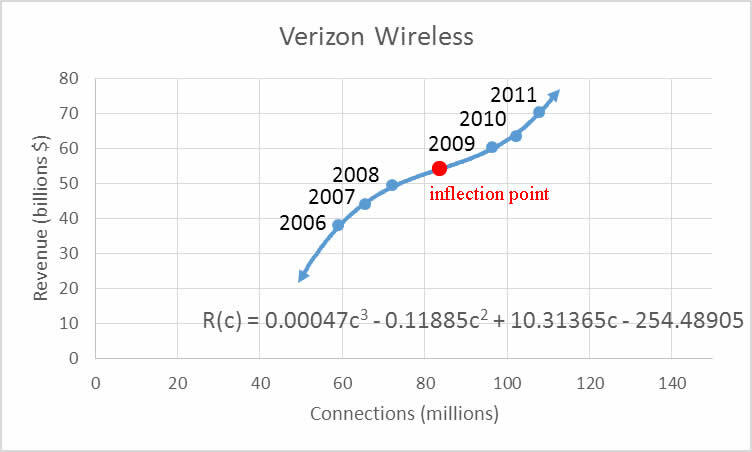 On the right side of the point of inflection, increasing the connections results in larger and larger increases in revenue. Although a relative extrema may seem to be very similar to an absolute extrema, they are actually quite different. The term “relative” means compared to numbers nearby…so a relative extrema is either a bump or a dip on the function. The term “absolute” means the most extreme on the entire function. An absolute extrema is the very highest or lowest point on the function. This may occur at a bump or a dip. They may also occur at the ends of the function if it is defined on a closed interval. The MathFAQ below illustrates how to find these points on a function. How do we make decisions about inventory? Most businesses keep a stock of goods on hand, called inventory, which they intend to sell or use to produce other goods. Companies with a predictable demand for a good throughout the year are able to meet the demand by having an adequate supply of the good. A large inventory costs money in storage cost and carrying low inventory subjects a business to undesirable shortages called stockouts. A company’s inventory level seeks to balance the storage cost with costs due to shortages. A light emitting diode (LED) is a light source that is used in many lighting applications. In particular, LEDs are used to produce very bright flashlights used by law enforcement, fire rescue squads and sports enthusiasts. Suppose a manufacturer of LED flashlights needs 100,000 LED bulbs annually for their flashlights. The company may manufacture all of the LED bulbs at one time or in smaller batches throughout the year to meet its annual demand. If the manufacturer makes all of the bulbs at one time they will have a supply to make flashlights throughout the year, but will need to store bulbs for use later in the year. On the other hand, if they make bulbs at different times throughout the year, the factory will need to be retooled to make each batch. Figure 1 – Inventory levels at the manufacturer over a one year period. In (a), all bulbs are made at the beginning of the year and used at a constant rate throughout the year. In (b), two batches of 50,000 are made. In (c), 4 batches of 25,000 are made. In (d), 8 batches of 12,500 are made. In each case, when the inventory reaches 0, the next batch is manufactured instantaneously. Since the manufacturer does not need to make LED bulbs continuously throughout the year, they will use the manufacturing capacity for other purposes during the rest of the year. When they do manufacture the bulbs, the factory will need to be set up for this purpose. For this manufacturer, it costs 5000 dollars to set up the factory to manufacture LED bulbs. This amount covers all costs involved in setting up the factory such as retooling costs, diminished capacity while the production line is retooled, and labor costs. Each time the company manufactures a batch of bulbs, they incur this cost. Obviously, the more times the plant retools, the higher the total cost is. The company pays a holding cost to store any LED bulbs not used. The holding cost includes the taxes, insurance, and storage costs that change as the number of units stored changes. If they manufacture all of the bulbs at one time, they will have to store more bulbs throughout the year. For this manufacturing plant, it costs $1 to hold a bulb for one year. We’ll assume that the company’s production cost does not change throughout the year. In other words, whether they manufacture the bulbs all at once or in several batches throughout the year, it will cost them the same amount per unit to manufacture the bulbs. For this plant, it costs 25 dollars to manufacture an LED bulb. The total cost for the manufacturer is the sum of the set up, holding and production costs. For other manufacturers, other costs may be included in this sum. However, we’ll assume that the total cost for this plant is restricted to these three costs. If they produce more LED bulbs in each batch, the set up costs will be lower but they will pay a higher holding cost. On the other hand, if they produce fewer bulbs in each batch they will lower the holding cost. This decrease in holding cost is accompanied by an increase in the set up cost since more batches will be needed to meet the annual demand. The manufacturer faces a simple question: how many units should they manufacture in each batch so that their total cost is minimized? The batch size that results in the lowest total cost is called the economic lot size. A manufacturing plant needs to make 100,000 LED bulbs annually. Each bulb costs 25 dollars to make and it costs 5000 dollars to set up the factory to produce the bulbs. It costs the plant 1 dollars to store a bulb for 1 year. How many bulbs should the plant produce in each batch to minimize their total costs? Solution To find the economic lot size, we need to analyze the costs for the plant and model these costs. What kind of costs will be incurred? Three different types of costs are described in this example. A set up cost of 5000 dollars is incurred to set up the factory. A production cost of 25 dollars per bulb is incurred for labor, materials, and transportation. Since the demand for bulbs occurs throughout the year, we’ll need to store some of them in a warehouse at a holding cost of 1 dollar per bulb for a year. Figure 2 – If all of the LED bulbs are produced in one batch, the average inventory is 50,000 bulbs. The largest cost in this sum is the production cost. If the cost to make a bulb is fixed and we don’t change the number of bulbs produced each year, changing the batch size won’t affect this term. We can lower the holding cost by producing fewer bulbs in each batch. But this increases the set up cost since the production line will need to be set up more often. Figure 3 -If the LED bulbs are produced in two batches, the average inventory is reduced to 25,000 bulbs. for storage costs of 25,000 × 1 dollar or 25,000 dollars. The production line will need to be set up twice at a cost of 2 × 5000 dollars or 10,000 dollars. In this case, the holding cost dropped by 25,000 dollars, but the set up cost increased by 500 dollars. This results in a lower total cost. As the lot size decreases, the set up cost increases and the holding cost decreases. Initially, the holding cost is much higher. But for smaller batch sizes, the set up cost is much higher. Somewhere in the middle is a batch size whose total cost is as small as possible. In every row of the second column, the production cost is the same. So changing the size of the batch has no effect on the production cost. Let’s add these expressions to the table. Notice that the expression in the last row for the total cost preserves the pattern for all values of Q above it. Notice that the production cost drops out of the critical point calculation meaning the production cost has nothing to do with the economic lot size. This function is undefined at Q = 0. But a batch size of 0 is not a reasonable answer since a total of 100,000 bulbs must be made. Only the quantity 31,623 bulbs makes sense. But is this critical point a relative minimum or a relative maximum? A lot size of approximately 31,623 bulbs leads to the lowest total cost possible of 2,531,622.78 dollars. Some companies purchase their inventory from manufacturers. Instead of deciding how many units to manufacture in each batch, they must decide how many units they should order and when they should order the units. For a business like this, the set up cost is replaced by the ordering cost. The ordering cost includes all costs associated with ordering inventory such as developing and processing the order, inspecting incoming orders, and paying the bill for the order. Larger companies may also have purchasing departments. The ordering cost also includes the cost of the personnel and supplies for the purchasing department. Ordering more often lowers holding cost since it results in lower inventory levels. This also raises ordering cost since more orders must be placed. The total cost is minimized at an order size that balances the ordering cost and the holding cost. This order size is called the economic order quantity. 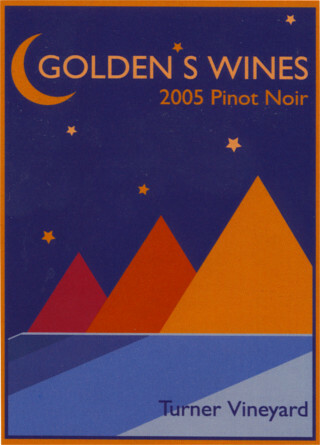 The annual demand for a particular wine at a wine shop is 900 bottles of wine. It costs 1 dollar to store one bottle of wine for one year. It costs 5 dollars to place an order for a bottle of wine. A bottle of wine costs an average of 15 dollars. How many bottles of wine should be ordered in each order to satisfy demand and to minimize cost? Solution Upon examining this problem, it might appear that the wine shop should simply order 900 bottles of the wine once a year. While this is a possible solution and lowers the ordering cost, it would incur a large holding cost. The wine shop could also place 18 orders of 50 bottles each. This would lower the holding cost, but increase the ordering cost. Another possibility would be to order each bottle individually. This would lower the holding cost even more, but increase the ordering cost. The appropriate order size will balance the holding cost and the ordering cost so that the total cost is as small as possible. To solve this problem, we need to find a total cost function. Once we have this cost function, we’ll take the derivative of the function to find the critical points and locate the relative minimum. For this problem, we need to vary the order size to see the effect on the costs. For this reason, the variable in this problem will be the order size Q. Let’s calculate the costs for several different values of Q to see the relationship between the order size and the total cost. Thus the storage costs will be 450 bottles ×1 dollar per bottle to store. Each bottle of wine costs an average of 15 dollars, so 900 bottles will cost 900(15 dollars) or 13,500 dollars. Look at each line of this table. 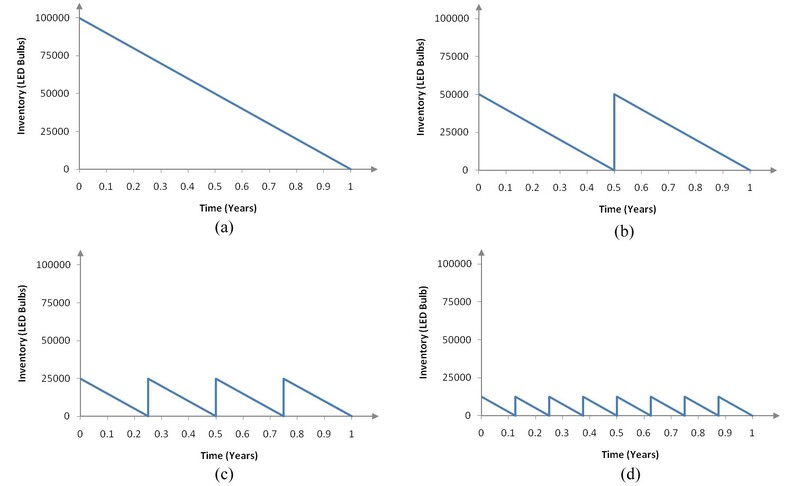 As the order size decreases, the reordering costs increase and the storage costs decrease. The sum of all costs starts at 13955 dollars and decreases initially as the storage costs drop. However the reordering costs begin to build up eventually causing the total ordering cost to increase to 4500.50 dollars for an order size of 1 bottle. Each ordering cost in the second column consists of the 5 dollars cost to order times a value. This value is the number of orders you will need to make during the year. Each holding cost in the third column consists of the 1 dollar cost to store one bottle for one year, times the average inventory. The expression we have written for the total costs preserves these patterns. so the original function TC(Q) is concave up. The critical point at Q ≈ 94.87 is a relative minimum. Should the wine shop order 94.87 bottles of wine? Bottles of wine are sold in integer amounts so we have two options: order 94 bottles (and not meet the demand) or order 95 bottles (and have a few bottles extra at the end of the year). You might choose to order 95 per order to simply insure that you satisfy all customers, but which option is cheapest? In deciding which option is better, you’ll need to balance what is the biggest benefit and what are the costs of the decision. In this case, an order size of 95 is slightly cheaper than an order size of 94 and ensures that all customers are satisfied. How do you find the optimal dimensions of a product? The size and shape of a product influences its functionality as well as the cost to construct the product. If the dimensions of a product are designed to minimize the cost of materials used to construct the product, then the objective function models the cost of the material in terms of the dimensions of the product. In Example 1, we find an objective function for the cost of materials to build a rectangular enclose. By finding the relative minimum of this objective function, we are able to find the dimensions of the enclosure that costs the least amount. A farmer is fencing a rectangular area for two equally sized pens. These pens share a divider that will be constructed from chicken wire costing $0.60 per foot. The rest of the pen will be built from fencing costing $1.10 per foot. If the pens should enclose a total of 400 square feet, what overall dimensions should the pens have to minimize fencing costs? Solution To find the minimum fencing costs, we must formulate a function that describes the cost of fencing as a function of some variable. In this problem, we have two variables we could use. The width or length of the enclosed region can be the variable. In this example, we’ll choose the variable to be the width of the region. Each of these terms describes the cost of individual components of the fencing around the enclosed area. The first term matches the parts of the fencing along the top and bottom of the figure costing $1.10 per foot. The second term matches the two parts of fencing along the sides costing $1.10 per foot as well as the divider costing $0.60 per foot. A table is useful to help us recognize the function describing the cost of the fencing. In this table, each column will represent the quantities that will vary, the two terms in the cost of fencing as well as the total cost of fencing. The table below contains five columns for these quantities and five blank rows in which we’ll place some values. Now let’s calculate the costs involved in fencing a pen that is 5 feet by 80 feet. The cost involved in fencing a pen that is 10 feet by 40 feet is calculated in a similar manner. This expression is almost identical to the earlier expression except amounts of fencing are different. We can continue to calculate other sized pens to fill out a table of values. to ensure the area is 400. The other entries in the last row use the width and length to match the pattern in the rows above. The negative critical value is not a reasonable dimension for the width of the pen so we can ignore it. , we observe that it is undefined at w = 0. Like negative values, a width of zero is not a reasonable dimension for a pen. Ignoring this value, we have only one critical value, w ≈ 22.56, in the domain of this problem. This critical value may correspond to a relative minimum or a relative maximum. We can use the first derivative test to determine which type of extrema this critical value matches. If we test the first derivative on either side of the critical value, we can establish where C(w) is increasing and decreasing. This first derivative test indicates that the function is decreasing and then increasing so w ≈ 22.56 corresponds to a relative minimum. For some businesses, the goal of the design process is not a product that costs as little as possible. Instead, they maximize or minimize some characteristic of the product with respect to the dimensions of the product. For instance, a newspaper publisher might maximize the area of the printed page with respect to the margins and dimensions of the page. By doing this, they maximize the area used to print news as well as the area used for advertisements. In the next example, we find the dimensions a piece of carry-on baggage that maximizes the volume inside the bag and meets airline requirements for the dimensions. Most airlines charge to check baggage on flights. To avoid these charges, passengers pack as much as possible into their carry-on bags. However, airlines also limit the size of these bags. American Airlines limits the linear dimensions (defined as the sum of the length, width and height) to 45 inches. A manufacturer wishes to produce a carry-on bag whose linear dimensions are 45 inches. The shape of the bag is a rectangular solid, like the one pictured, below whose ends are squares. What are the dimensions of the bag if its volume is to be as large as possible? Solution We want to maximize the volume of the carry-on bag. To help us understand the relationships between the dimensions, let’s look at a particular carry-on bag. Suppose the dimensions of the square ends are 5 inches by 5 inches. Since the sum of the length, width, and height must be 45 inches, we know the length must be 45 – 5 – 5 = 35 inches. Notice that these dimensions result in a larger volume. We can continue this process to see if the volume continues to increase as the square end gets larger. To keep track of the information, let’s enter this information into a table. As the dimensions of the square end increases, the volume rises and then falls. It appears that the optimal dimensions are around 15 inches by 15 inches by 15 inches. To find a more exact answer, we need to come up with an expression for the volume. We do this by identifying the variable as the width w and look for pattern in each column of the table. If the width corresponds to w, so must the height since the ends are square. If we subtract these dimensions from 45, we get the length . The volume is the product of these dimensions. This derivative is set equal to zero to find the critical values for the function. Since the derivative is a polynomial, there are no values of w for which the derivative is undefined. Additionally, all critical values must be positive since the width must be a positive number. The volume function increases initially and then decreases after w = 15. This matches the behavior we saw in the last column of the table. It also tells us that the critical value corresponds to a relative maximum. The optimal solution occurs when the square end is 15 inches by 15 inches and the length is 45 – 15 – 15 or 15 inches. The volume at these dimensions is (15 inches)(15 inches)(15 inches) or 3375 in3. Goto How do we make decisions about inventory? How do you minimize the average cost for a business? When businesses produce goods or services, they incur costs. As discussed earlier, these costs may be variable costs or fixed costs depending on whether the cost changes as the production changes. Whether a cost is variable or fixed depends on the time period over which the costs are analyzed. In the short run, at least one of the business’s inputs are fixed. For instance, its technology and size of the factory may be fixed and the number of workers may be variable in the short run. The fixed costs then correspond to the cost of the fixed inputs and the variable costs correspond to the cost of the variable inputs. In this text we look at costs primarily in the short run. The time period over which all inputs may be varied is called the long run. In the long run, the business can vary any of its inputs. In this case, it may change its technology and change the size of the factory. The actual length of time that constitutes the long run varies from company to company. A restaurant may be able to increase the size of its kitchen or dining area in a few months while a semiconductor may need a year or more to change its manufacturing process. The idea of optimizing costs is not a matter of minimizing costs. Since costs increase as production increases in the short run, the minimum total cost occurs at a production level of zero. Instead of minimizing the total cost, businesses minimize the average total cost. where Q is the number of barrels of beer produced each year in thousands. a. Find the average total cost function . b. Find and interpret . The average cost when 1000 thousand barrels of beer are sold is 148.044 dollars per barrel. This means, on average, each barrel costs this amount to produce. c. Find the production level that minimizes average cost. This derivative will be used to find the critical values and to apply the first derivative test. The critical values are found by determining where the derivative is undefined or equal to zero. Since the denominator of the derivative, Q2, is equal to zero at Q = 0, there is a critical value there. 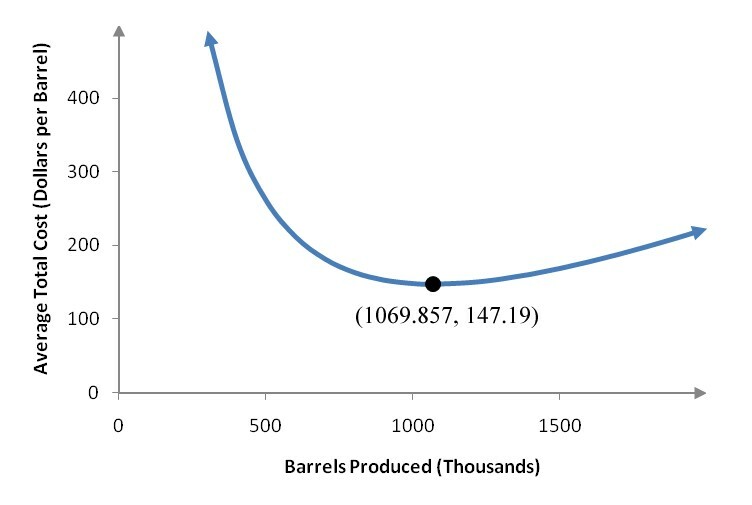 However, a quantity sold of 0 thousand barrels is not a reasonable solution. In fact, the average cost function is undefined there so we ignore that critical point and restrict our attention to quantities sold Q that are positive. To find the critical values, we must solve this equation for Q. We could utilize the quadratic formula, but it is easier to solve for Q directly. Only the positive critical value is a reasonable production level for the Boston Beer Company. This critical value may be a relative maximum or a relative minimum. The first derivative test allows us to classify the critical value by testing the first derivative on either side of the critical value. For this function, quantities sold that are positive are the only allowable values. We begin the first derivative number line by restricting it to positive quantities. Let’s record this information on the first derivative number line. 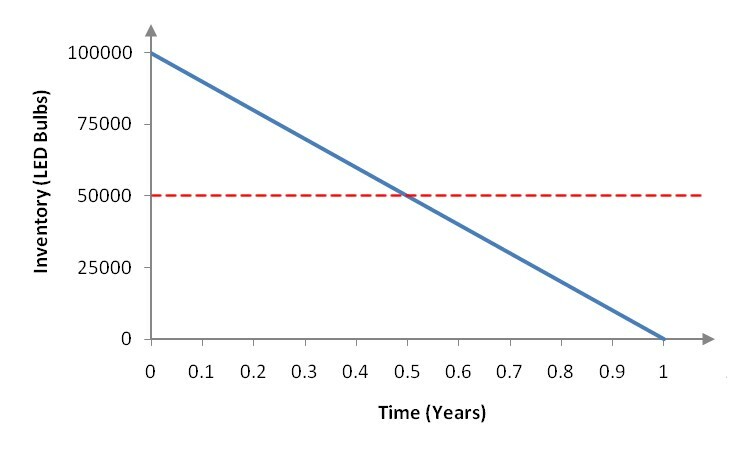 Figure 2 – The average total cost function and its relative minimum.